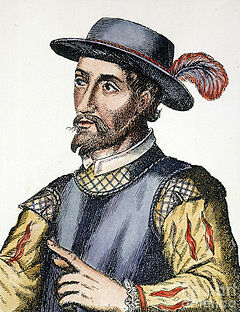 Ponce de León decided he should return to Spain and personally report the results of his recent expedition. He left Puerto Rico in April 1514 and was warmly received by Ferdinand when he arrived at court in Valladolid. There he was knighted, and given a personal coat of arms, becoming the first conquistador to receive these honors. He also visited Casa de Contratación in Seville, which was the central bureaucracy and clearinghouse for all of Spain's activities in the New World. The Casa took detailed notes of his discoveries and added them to the Padrón Real, a master map which served as the basis for official navigation charts provided to Spanish captains and pilots. ^ a b Torres Sevilla-Quiñones de León 1999, p. 191. This page was last edited on 3 April 2019, at 03:20 (UTC).